It was a "I really need to get to the farmer's market" moment yesterday. It's at times like that, when I have to get creative, that I discover new combinations. I had never thought to pair earthy beet greens with creamy butternut squash. I don't know why, because really, it makes perfect sense. Needless to say, I was pleasantly surprised and might even make this again on purpose. Toss the diced butternut with the cayenne pepper, dried thyme, salt pepper and a few tablespoons of the olive oil. Then arrange the pieces in a single layer on a rimmed baking sheet. Roast in the oven for about 25 minutes or until the pieces are tender. In the meantime, heat the remaining olive oil in a large saute pan over medium heat. Place in the onions and garlic. Saute until the onions become translucent. Add the chopped beet greens and cook for 10 to 15 minutes or until tender. Pour in the balsamic vinegar and cook for 5 more minutes. Season with salt and pepper (to taste). 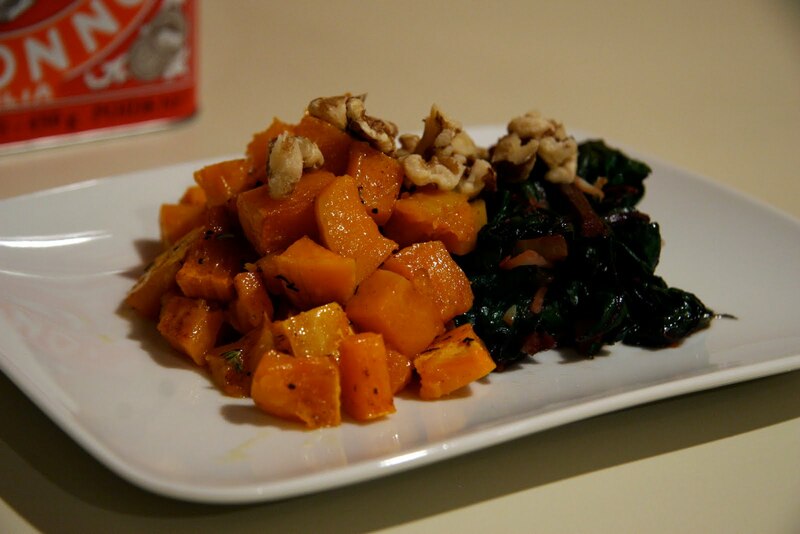 To serve, plate each vegetable side by side and sprinkle some of the chopped walnuts across the top. Have you discovered any new ingredient combinations in your kitchen?